Spruce up your graduation party with our free graduation printables! All you have to do is enter your email address and we’ll send you a pdf with the printables that you can cut out and use however you like. 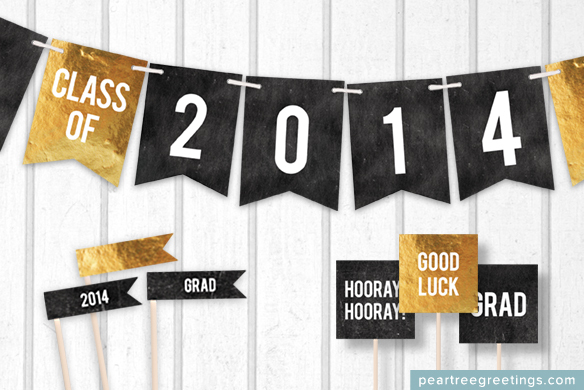 The free graduation printable includes a black and gold 2014 banner and cake or food toppers. Hope you enjoy! See more graduation party ideas or visit our site to order your graduation announcements today! These look awesome , I’m sure my son will love it . I WOULD LOVE TO ACCESS YOUR 2014 GRADUATION PRINTABLE. I NEED A LITTLE SOMETHING TO SPRUCE UP MY DAUGHTERS GRADUATION PARTY AND ALL LOCAL SHOPS SEEM TO BE SOLD OUT . Would love to have access to your graduation printables. Thanks! Hi Sally, great! You can click here to sign up to get them: http://www.peartreegreetings.com/free-graduation-printable/ They are from 2014; so if you would like party decorations that have 2015 on it, you can shop here: http://www.peartreegreetings.com/Graduation/Graduation-Party-Decorations/index.cat Enjoy! !